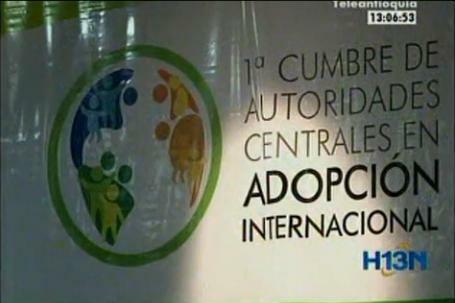 I have labelled these two attached images as CACI (one and two) because of the initials of the event in which I saw them, the "Primera Cumbre de Autoridades Centrales en Materia de Adopción Internacional" (First Summit of Central Authorities in charge of International Adoption), an event held in Medellín between May 29 and 30, 2013, with the purpose of analyzing the challenges of this practice worlwide. The event was organized by the ICBF the local authority in charge of this in the host country (Colombia). In this video, (source: Hora 13 Noticias, local news), one can see a desktop flag (1:08) which seems to show the logo of the summit. 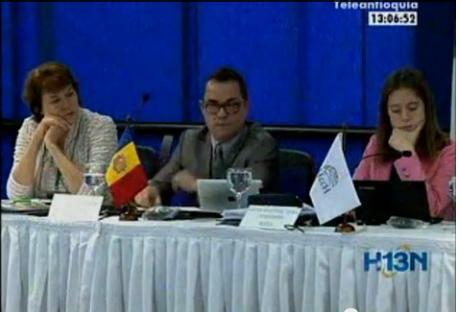 This white desk flag in front of that lady is flag of HCCH (Hague Conference/Conférence de La Haye). There is a better visible image of that flag: at this site. Its logo consists of blue latitude lines and HCCH abreviation placed under the lines. 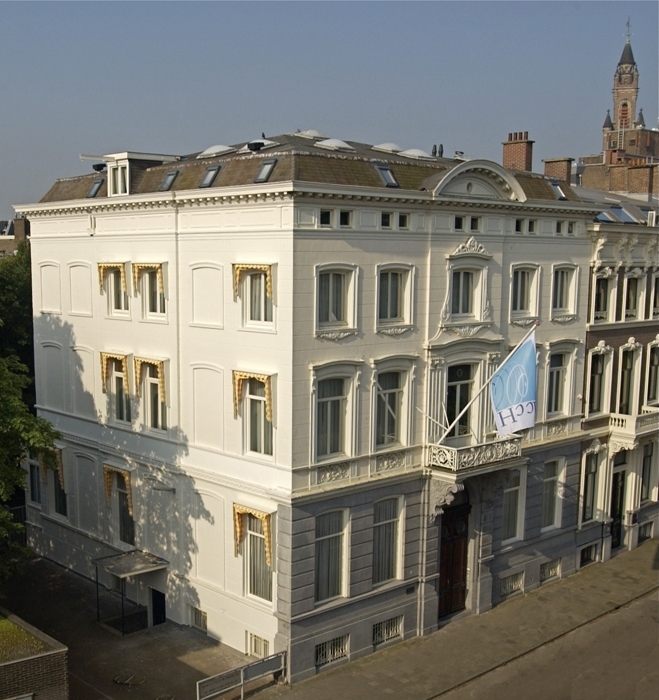 However, the Permanent Bureau of HCCH uses an other flag which also white but a large light blue panel at hoist wears the latitudes, and abbreviation placed vertical next to fly-side of blue panel. Searching for further information on the organization you mention, when I looked up at the Member States section of the HCCH I didn't find Colombia as a Member State de jure. So, to me at least, it is a bit weird that a non-Member can host an international congress on the subject (even if it has the status of an Observer State).